Although attention has understandably focussed on the Western Front in the Great War, the conflict was a World War fought across many different theatres. Battles raged from the deserts of the Arabian peninsular and the Holy Land, to the jungles of East Africa, and the beaches of Gallipoli. 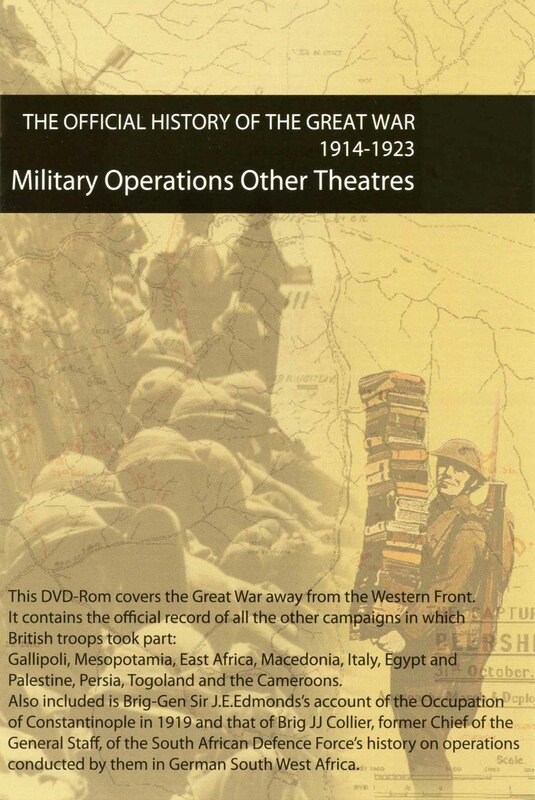 No study of the Great War can be complete without an examination of this DVD-Rom. With Britain finding itself assuming responsibility for ever longer stretches of the Western Front it had to simultaneously find men to fight the Turks at Gallipoli, in Egypt and in Mesopotamia to assist the Serbs, and to reduce the garrisons of Germany’s African Colonies. Includes all 19 Official Volumes and associated map cases, all mapping is reproduced in full colour. 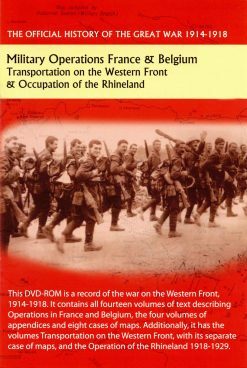 This DVD-Rom covers the Great War away from the Western Front, it is a follow-on to our successful DVD-Rom, which provided the official record of the fighting in which British troops were involved in France and Flanders during the Great War 1914-1918 – the Western Front. It contains the official record of all the other campaigns in which British troops took part: Gallipoli, Mesopotamia, East Africa, Macedonia, Italy, Egypt and Palestine, Persia, Togoland and the Cameroons. Also included is Brig-Gen Sir J.E.Edmonds’s account of the Occupation of Constantinople in 1919 and that of Brig JJ Collier, former Chief of the General Staff of the South African Defence Forces history on operations conducted by them in German South West Africa. A PC running Windows 7, 8, 10, or Vista with 512MB RAM installed and a 4X speed DVD drive. Fully 64 bit compatible.